Ordering Information: To order, click on ADD TO CART button. Shopping Cart will display at top of page only when items have been added to the cart. Items also available for purchase at our on-site Gift Shop. The Women of Lawrence County provided critical and significant roles in the history of our county. Our 2015 Calendar features sepia and black & white historical photos from 1880-1942. Our cover photo (Inspecting Shells at United Engineering 1942) has a mesmerizing feel to it. The style is Art Deco and looks like a Hollywood screen set even though it is a real photo of an actual worker with real products. In addition to a feature photo, each month includes information about historical dates significant to Lawrence County’s history. 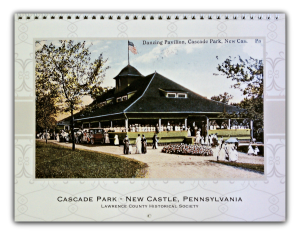 For example: February 7, 1907 (First Warner Theater “The Cascade Palace” opens on South Mill Street, New Castle). 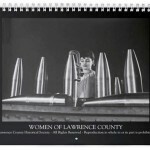 Our 2014 calendars were only available for on-site purchase. 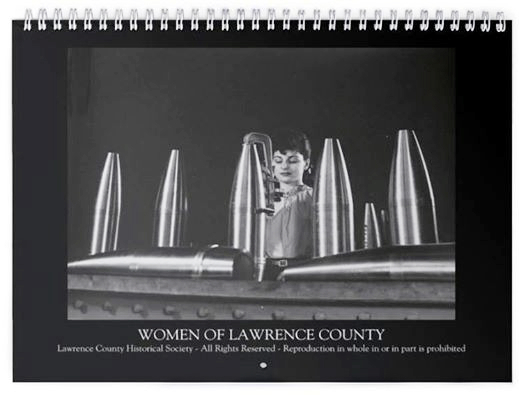 For our 2015 calendar, we made it possible for anyone to purchase one (or several) of the calendars by creating a special package price that includes First Class shipping to any USA address. Price (included FREE USA shipping): If shipping to a foreign address, we reserve the right to charge additional shipping fees. 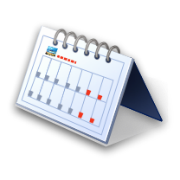 BEFORE ordering for shipment to a foreign address, CONTACT US. Extras may be available at our on-site Gift Shop. Feel free to come and visit and see what we have available for on-site purchase. It’s a great opportunity to view our FREE exhibits and browse through the wide variety of gifts we have for sale.